If you like mushrooms, ginger, or Chinese food (or any of the three), this dish is for you. 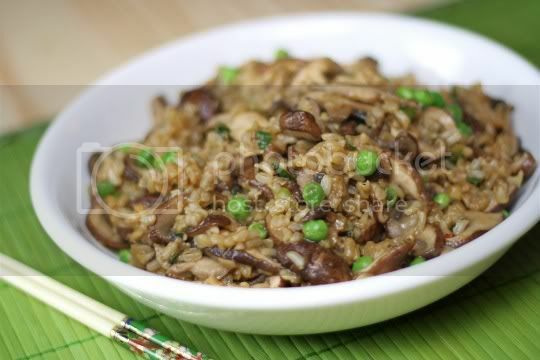 It's a different take on the traditional fried rice, and a great way to use up any leftover rice sitting around in your fridge (white or brown would work, although the recipe calls for brown). Aside from all the veggie prep, it's a simple and healthy meal that makes either a hearty main course or a super flavorful side dish. Once you get all 1 1/4 pounds of mushrooms sliced (the recipe suggests removing the gills from the shiitakes, but I didn't), the rest of the cooking is a breeze. Saute the mushrooms in two batches (or one, if you have a big enough pan), set the aside, then saute green onions, ginger, red pepper flakes, rice, soy sauce, and vegetable broth. 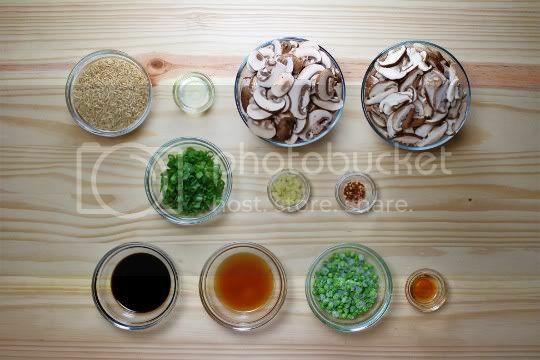 Once that's heated through, add the mushrooms and frozen peas, and finally stir in a little sesame oil. 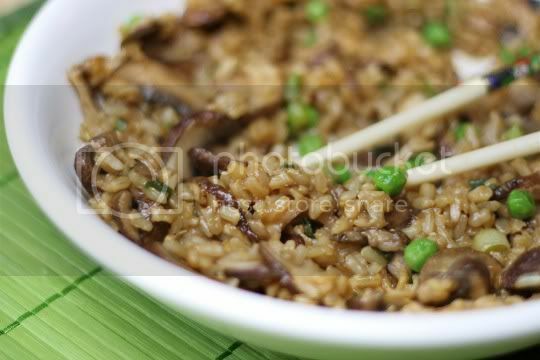 The finished fried rice is chockful of mushrooms, and is so ridiculously earthy and rich, you'll almost forget you're eating a Chinese dish. Seriously, it's VERY mushroom heavy. Fortunately, the spicy pungent ginger and sweet juicy bursts of peas break up some of the earthiness, and the flavors do seem to mellow a bit as leftovers. The ginger, however, seems to intensify! Another interesting thing about the dish is that the saltiness (which initially is the perfect amount) seems to also mellow out; I found myself wishing I could douse a little soy sauce over my reheated leftovers (oooh, and I bet some sriracha would do wonders!). Overall, this was a very hearty, filling, and satisfying dish. Pair it with a sweet-and-sour glazed tofu, or some kind of sweet or tangy vegetable side for a Chinese-inspired meal. Make again? Maybe. Quick, easy, and relatively few (and inexpensive) ingredients...although I might cut back on the mushroom amount in the future. Just discovered your blog after spying this mouth-watering picture on the Vegetarian Times FB page. Considering I adore every single ingredient in this dish - and we're trying to move focus away from animal foods after reading The China Study - you can be sure we'll be making this one. Perfectly delicious, this looks like a great tasty and easy meal with lots of added yum!! Hi again, well I made it yesterday. It was very nice but next time could be better. What would I change (from what I did at least)? Fresh mushrooms (rather than dried shiitakes) would make a huge difference - but I couldn't find them here. I'd also up the ginger a little. But most of all... I'm not sure, but it seemed to me that the proportions over on the original Vegetarian Times recipe page were well off. Their mushrooms come to 20oz altogether, to serve 4, which is 500 grams European! I'd have had to buy the whole supermarket's stock to get that many, and it was clearly wrong. Matt...where are you located that fresh mushrooms aren't available? I think that definitely would have made a difference. As far as the amounts go, the total combined 20 oz was probably about 4 big handfuls of mushrooms, which was defintely a lot for the dish. But I do think their serving size was off; it would much better feed six than four! One serving for four was a lot! I'm not a mushroom girl, but this looks amazing! You know it's gotta be good if even I like the looks of it! :) Love the peas in there, too!